We are currently offering Piano/Keyboard, Voice, Guitar, Bass, Ukulele, Mandolin, Banjo, Drums/Percussion, Trumpet, Saxophone, and DJing! As a beginner you will be taught the chords, technique, and theory that will give you understanding and access to the music you want to play. We incorporate songs, both from our choosing and yours, to help keep you progressing and motivated! Whether you want to play in a band or be a solo star, we give you the tools you need to quickly succeed. The answer is absolutely anyone who has a passion for music and a strong desire to learn. This is not exclusive to beginners; more importantly it is NOT exclusive to younger ages. Any person who loves music and sincerely wants to learn an instrument is perfect for our systems. Our teachers possess unique insights which can help any person at any stage of their instrumental journey. Our teaching methods have been proven to create success and understanding in all ages on all instruments. Our clients are our family; we show up to work because we care about what we do and who we do it for. When you come to OMS you become a part of a unique community which values love, music, and shared success above all else. Sign up! Sign up!! SIGN UP!!!!! Submit your information on our home page, click the RESERVATIONS button below, or come on down and see for yourself! Still need convincing? The first lesson is on the house! A 30-minute trial lesson in any instrument/class you are interested in. SIGN UP BELOW! Please fill out the form and we will contact you shortly. 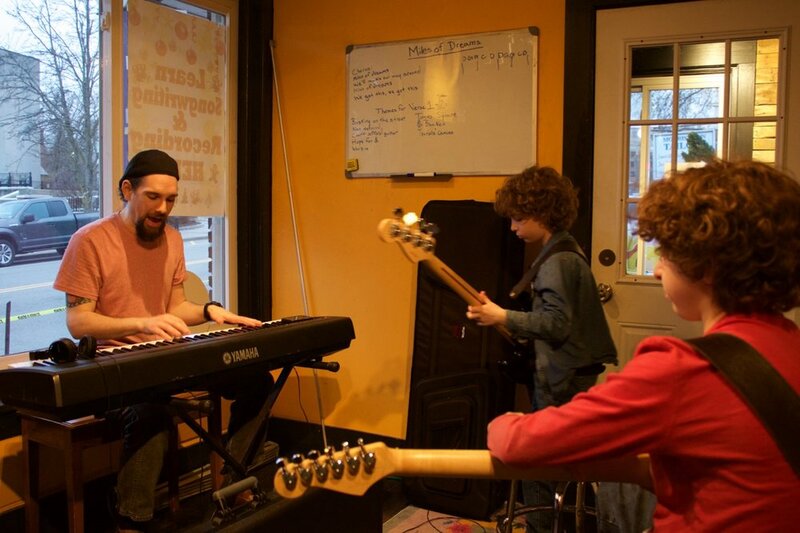 LEARN ABOUT OUR CHILD/ADULT GROUP SONGWRITING! !